Glenn Irwin was welcomed back into the Burrows Engineering Racing team for a cameo appearance at the Sunflower Trophy races at Bishopscourt in County Down at the weekend. The event is Ireland’s premier short circuit meeting and British Superbike rider Glenn, who previously rode for John Burrows’ Dungannon-based team in 2015, made a successful return on the 650cc Kawasaki, winning both Supertwin races at the 1.8-mile circuit on Saturday. Irwin saw off Dan Cooper and young gun Eunan McGlinchey in the opening race, with the 28-year-old capping a double after a hard-earned victory in race two – billed as the Junior Sunflower Trophy Race – beating ex-Grand Prix rider Jeremy McWilliams. The Carrickfergus man won £400 in prize-money and in a kind-hearted gesture, Irwin and his sponsors have boosted the amount to £4,000, which they will donate to the young family of William Dunlop. William was sadly killed in a crash this year at the Skerries 100. 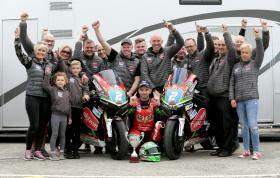 Saturday’s two Supertwin victories were the perfect finale to the season for the Burrows Engineering Racing team, and a fitting way to end the team’s involvement in the Supertwin class. “What a way to finish off our last races in the Supertwin class, with Glenn doing the double at Bishopscourt. In all, Glenn has started five races for us as a team and won four of them, with two Supertwin wins at the Sunflower in 2015 and another two at the weekend. He also finished fourth on our bike in the Supertwin race at the Ulster Grand Prix in 2015 in the wet, after setting pole. We will focus on the 1000cc and 600cc classes going forward, so this is the perfect way to sign off in the Supertwins class. “It’s always nice to take the win though and it was one of our better wins, although any time you get a victory as a team, it always feels special in that moment. It’s hard to measure it up against other victories we have achieved as a team but it was definitely up there. “All in all, it has been a tremendous season for the team with Davey Todd excelling at the internationals and Derek Sheils picking up some wins at the beginning of the season. Derek rounded off the road racing season with a double at Killalane, and with Glenn’s two wins at the Sunflower, it has been a great way to bring the year to a close. Hopefully we will be able to work with Glenn again in the future. He is a pleasure to work with, a true professional, and it was a fantastic gesture by him to donate £4,000 to William Dunlop’s family. Glenn and his sponsors weighed in to match his £400 prize-money that he got for winning the Supertwin races and that is just the measure of the man. “Fair play to John and the team because they did a fantastic job with the bike. Jeremy McWilliams was so fast in a straight line, phenomenal, but I don’t why that was! Joking aside, his bike was an absolute missile but I was able to make up ground through the corners. It was an enjoyable day and I always promised John that I would come and ride for his team again. It was nice to do that, but also it was nice to be able to donate £4,000 to William Dunlop’s young family. The B.E, Racing Kawasaki Supertwin machines are now up for sale. If anyone is interested in purchasing the bike, please get in touch.